Today's blog is devoted to our pal Eric, the biggest Boston Red Sox fan we know! Making architectural replicas in cake is always a time consuming process and the added pressure of having it look like an iconic structure that everyone recognizes makes them difficult to do. We were hired to make a Fenway Park Groom's cake for a bride wanting to surprise her fiance, who is from Boston and a HUGE Red Sox fan, with one of his favorite places. Neither Rick or I have ever visited Fenway Park and had to rely on photographs available on the internet. As fate would have it, one of our close friends, Eric, is a huge Boston Red Sox fan -- he and his wife even have a dog named "Fenway"-- and gave Rick many insider tips and pointers, something that would be appreciated by a true Red Sox fan. When making the cake, Rick included the Green Monster score board and had Red Sox winning over the Yankees, with all zeros for the Yankees. He also included at Eric's suggestion, on the overhang in right field, the retired Red Sox numbers and provided us the correct order of the numbers, ending in a blue "42" for Jackie Robinson. A special touch on the cake was found on the billboard that read "Rick and Janice, January 29, 2011". 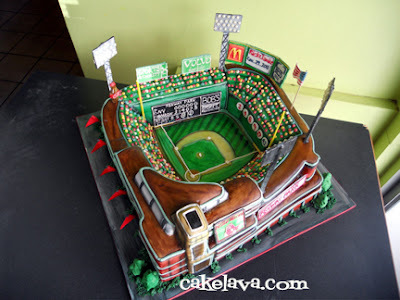 The Red Sox logo and the Fenway Park sign was also placed prominently on the cake. We can't thank Eric enough for giving us a devoted Boston Red Sox fan's perspective on this cake, and given his interest in the outcome of the design, he was the first person, after Janice and Rick, the bride and groom, to see photos of the cake. We hope we did Eric, Janice and Rick, and every Red Sox fan proud, and hope to one day experience Fenway Park in person. 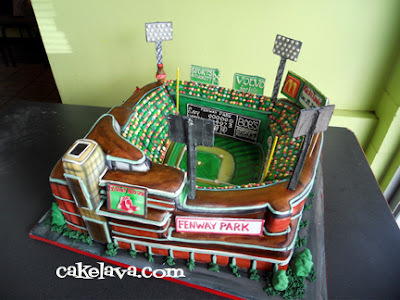 After sculpting it out of cake, Rick will never look at Fenway Park the same way again! Congratulations to Janice and Rick! Kat and Dmitriy were married on Oahu on December 30, 2010. 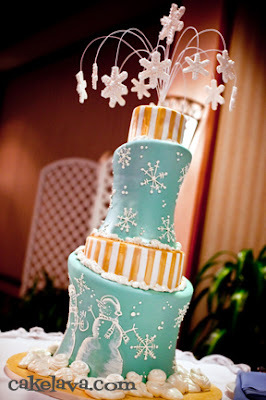 For their wedding they envisioned a winter themed cake with an "enchanted" feel that would be fun, beautiful and elegant in their colors of Tiffany blue and white with touches of gold. The Save-the-Date artwork they provided to us had two very cute snowmen celebrating in the snow, under a palm tree that said "Chill with Us in Hawaii!" Rick designed a 4-tier wedding cake with unusual shapes with the snowmen found on their save-the-date, and a custom snowflake topper. At the couple's request, he added two parrots on the backside of the cake, something hidden to their guests and special for just the two of them that they would enjoy. When delivered to their hotel, the cake perfectly matched the colors of the decor and was a big hit with both the couple and their guests. A special Thank you goes out to Kat and Dmitriy for giving us a theme that we could have fun with and to their photographer, the talented Julia Sieber of Sieber Studio for the beautiful cake images! 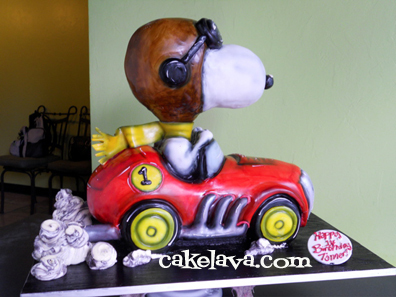 Today's blog is dedicated to Snoopy's biggest fans! I wanted to drop you a note to thank you so much for our cake! It was definitely the talk of Tanner's birthday and enjoyed by all his guests. Thank you again for doing a fantastic job and making Tanner's birthday extra special! This cake was so much fun and of course it brought back nostalgic feelings for both Rick and I! Thank you to our clients for giving us the opportunity to make it! Here is the second cake that served as a companion to our January 8th couple's beautiful elegant wedding cake. Although it was referred to as the "groom's cake", we can't exactly call it a groom's cake because it was a surprise for both the bride and groom by the bride's parents. This adorable black and white kitty is owned by the couple and the bride is a veterinarian specializing in feline behavior. Rick sculpted the kitty out of our Guava cake. 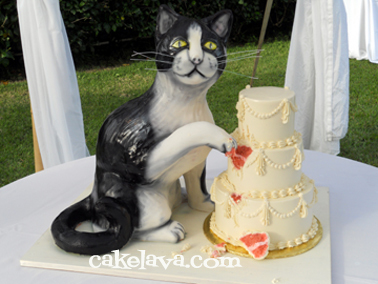 The 3-tier wedding cake beside the kitty is also guava cake. The kitty/wedding cake was a composition that got people talking. When we delivered the cake, we saw a couple kids talking to each other about how the kitty had gotten into the cake. It was a cute cake, a great conversation piece and a huge surprise to both the bride and groom! Congratulations to the couple! We will be out of town this week and will return to the blog once we return and have a chance to catch our breath. 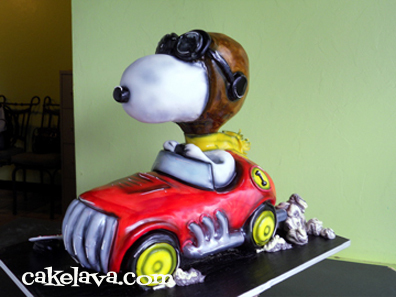 In the meantime, we invite you to visit our online portfolio of cakes at www.cakelava.com or join our facebook community! Aloha!! Today's blog is dedicated to my husband Rick, who spent approximately 25 hours last week making this amazing wedding cake for a couple who were married on Saturday. Between this gorgeous huge wedding cake and the accompanying sculpted groom's cake, which we will show next time, our schedule was completely filled and we've been turning away orders for the January 8th weekend since last Spring. Rick designed the cake in June and received approval shortly after. The approval to move forward was not from Karen, the bride, but from her parents, who had placed the entire design completely in Rick's hands, as requested by the bride. It is unusual to say the least, for a bride to release control over such an integral piece in the wedding. Karen desired to be surprised and felt confident Rick would design her a cake that would win approval by her parents, and as well as herself. When the cake was designed, we were all so excited to see it in person! Luckily for us, Karen had a fabulous wedding coordinator, Nichole Shin of Nichole Weddings & Events who assisted with the logistics of the two surprise cakes! The bride wouldn't see their wedding cake until the day of the wedding and the groom's cake was a surprise gift from her parents to the couple. This was a very unusual situation for us. Rick started making the flowers at the beginning of the wedding week. We had sugar petals laid out on trays all over our kitchen along with photos of our bride's exquisite Anne Namba designer gown which was used in the design of the cake. Anne Namba is a designer known for her "Kimono Couture" fashions. She uses beautiful Japanese silks with prints on them for her couture collection. Karen's silk bridal gown had a print similar to what is on the cake with gorgeous large flowers on part of the dress. We were instructed not to make the cake 4 tiers, because in Japanese culture the number 4 equals death, so Rick designed the cake with 5-tiers, with a few concave shapes and rounds, to mimic the feminity of the dress and play up the shape of the cake. 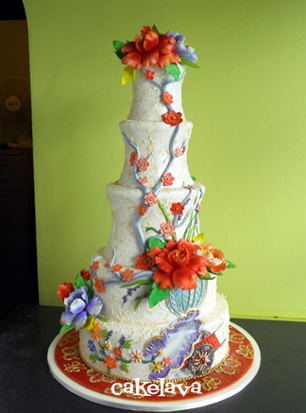 Flowers were handpainted and a delicate design was piped onto the base of the cake to mimic the look of the silk. The cake was very tall, extremely heavy and 4 different flavors on the inside. The wedding and reception were held at Kualoa Ranch's Moli'i Gardens, which feels like a lush, tropical rainforest, and is down the street from where LOST was filmed so you can just imagine how beautiful the location is. Congratulations to our couple and a huge thank you to her parents John and Mary and the couple's coordinator, Nichole. We have decided, this is our new "favorite" cake! Join us next time as we reveal the sculpted groom's cake, a most unusual design. Happy New Year! Now back to the cakes! Happy New Year everyone! It feels like ages since I last wrote on the blog. We've been consumed with the holidays and making cakes and are now beginning to get into the groove of 2011. It's looking like an amazing year with some unbelievable cake designs on order and lots of exciting things in the works! We can't wait to travel to Ontario, Canada in March, where Rick will be teaching at Icing Inspirations with two 3-day classes. Being able to meet Chrissie, our host, and all the students who we've gotten to know over a distance is sure to be one of our highlights of 2011. Here's to an incredible, fun-filled, unforgettable year for all of us! 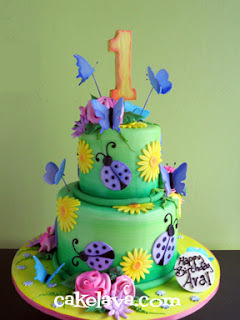 To kick off this exciting year, we're sharing a cake that just makes us feel good when we see it. It's cute, colorful and full of life! This pretty cake was made for Ava's first birthday in December.